Choque (pronounced “shock”) was one of the Portuguese words often used in Brazil to refer to athletic competitions, including “ring sports” as they were generally called. 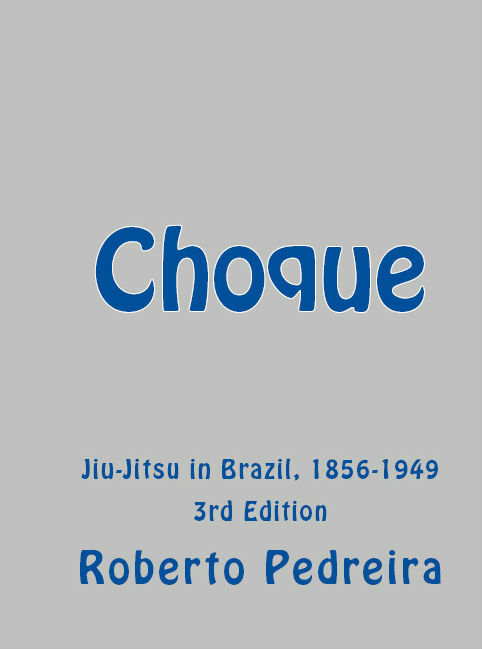 Choque: The Untold Story of Jiu-Jitsu in Brazil Volume I covers the Formative Period between 1856 and 1908, the First Boom of 1909 to 1916, the Glacial Age of 1916 to 1928, through the Golden Age of 1928 to 1940, up to the Dark Ages of 1941 to 1949, terminating with the virtual disappearance of jiu-jitsu in Brazil. During the Formative Period, organizational structures, venues, expectations, and cultural practices were established. Essential forms of media, transportation, and technology evolved. The man who more than any other single individual brought jiu-jitsu to Brazil, Paschoal Segreto, emerged. The First Boom covers the rise and fall of the first jiu-jitsu representative in Brazil, Sada Miyako, and his alleged Brazilian student Mario Aleixo. It continues with the arrival of Conde Koma (Maeda Mitsuyo) and his “troupe” of Japanese jiu-jitsu fighters in 1914. The Glacial Age chronicles the events that took place in São Paulo and Rio between Conde Koma’s virtual and actual retirement and the arrival of the first super-hero of the mixed martial arts in Brazil, Geo Omori. With Geo Omori, the Golden Age began. Following in his wake were the now famous names of Carlos, George, Oswaldo, and Helio Gracie, Takeo Yano, Yassuiti and Naoiti Ono, and many more. All of their legendary fights and publicity stunts are chronicled in fully documented detail. In the lead-up to World War Two, interest in jiu-jitsu declined precipitously. During the war, professional sports and entertainment of all varieties were curtailed or modified to meet the objectives of the war effort. Jiu-jitsu was highly dispensable. When the war was over, jiu-jitsu was supplanted by a different form of fighting known locally as “luta livre” and generically as “catch.” Jiu-jitsu men had no recourse but to accommodate to this new reality. Choque contains four extensive fact-filled appendices that will prove to be invaluable for researchers. They include an inventory of every known jiu-jitsu representative in Brazil between 1856 and 1949, opponents, promoters, managers, writers, organizations, referees, as well the names and addresses of major venues, gyms, and academies. Also provided is a chronology of all known and confirmed contests between jiu-jitsu representatives and other stylists. Separately indicated are unconfirmed but probable contests. Other appendices include teacher-student lineages and a glossary of jiu-jitsu terminology used up to 1949. Readers who are interested in the history of luta romana, capoeiragem, luta livre, boxing, and catch-as-catch-can in Brazil will also find a great deal of new material in Choque: The Untold Story of Jiu-Jitsu in Brazil Vol. I, 1856-1949.